More than a hundred business bosses have declared support for a Conservative-led government in a letter published in the Daily Telegraph. Signatories including former Dragons’ Den star Duncan Bannatyne, BP chief executive Bob Dudley, Prudential boss Tidjane Thiam, Arcadia retail group head Sir Philip Green, and Nick Robertson, chief executive of ASOS lined up to show their desperation to stab working-class people in the back in their worship of profit. They said they wanted a government that lowers corporation tax, so their firms don’t have to support public services and can pay more dividends to shareholders and executives. It seems clear they also wish to deter voters from electing a Labour government that would outlaw exploitative zero-hours contracts that allow them to get away without providing holiday or sickness pay for employees. Incredibly, they said the Coalition government, led by the Conservatives, had supported investment and job creation. It is hard to imagine where they think this has taken place. Government investment in infrastructure and support for businesses has plummeted under Tory control and, while the number of people in work has increased, 800,000 zero-hour workers is no credit to anybody. 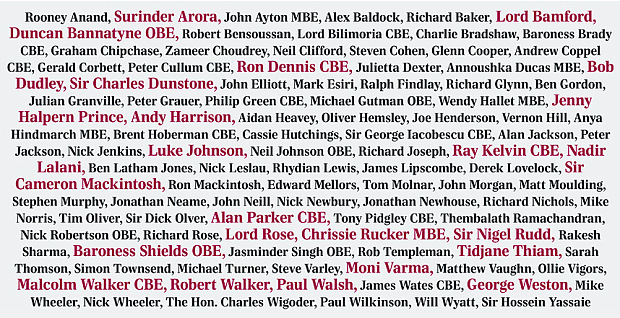 The Torygraph says the letter has five signatories who have previously supported New Labour: the entrepreneur Mr Bannatyne, the hotelier Surinder Arora, chairman of Dixons Carphone and Talk Talk Sir Charles Dunstone , theatrical producer Sir Cameron Mackintosh and businessman Moni Varma. Clearly these rats will jump ship to whoever they think will do them the most good, and the Devil take the rest of us. What fine examples of moral and entrepreneurial character! They really demonstrate why Tory supporters have been nicknamed “Self-Servatives”. Clearly they exist only to increase their own wealth at the expense of the people who actually work to make it for them; they are prepared to peddle falsehoods in order to perpetuate this situation, and happy to use their positions as business leaders to influence the outcome of what is supposed to be a democratic election. Last week, someone called Katie Hopkins, who this writer understands is some form of right-wing irritant, claimed that she would leave the country if Ed Miliband becomes Prime Minister – to a storm of applause across the social media. Many people suggested that she should not wait, but should leave immediately. Perhaps Mr Bannatyne and his co-signatories should consider taking the same boat. blowing the whistle on the rats who would ruin the UK. What a bunch of shysters! All in it together! Those who haven’t already got their knighthoods or lordships soon will have! I may not like them at all, but they do have the right to say what government they like, and of course they like the dreadful one we have now. Not only should we boycott these businesses, we should contact these people directly and let them know why we are boycotting their goods and services. It speaks volumes that the majority of them are OBEs and CBEs. Refuse them your hard earned cash and hit them where it hurts. Must study the list carefully and, wherever possible, boycott their shops/goods. 100 Bosses may have shown their support! I would doubt that their support would be worth the paper it is written on if, by some other means, another party were able to promise them even bigger profits at the expense of proper management. Let us hope that there are another few thousand decent employers out there who are cleverer and decent enough to make a fair profit from fair management of their workforces. Unless we get rid of this greedy government we will all pay the price in the end. The oddest thing about British business leaders supporting the Tories is that it is quite clear that this government has been particularly keen in favouriting FOREIGN corporations over local businesses. This is a worrying move. There was a lot of evidence that in 2010 the business leaders who wrote to the papers saying Labour ‘couldn’t be trusted with the economy’ had a real impact on voters. I’m no fan of Labour, but let’s hope voters aren’t swayed this time. Given the way the corporate sector has been feasting off the impoverishment of the people under the Coalition it would be collective madness for anyone to listen to them. More succinctly with regard to the signing of these letters and to (mis)quote Mandy Rice-Davis ” well they would, wouldn’t they”? I found it amusing that George Osborne said the move was unprecedented in modern politics. My experience is that something similar happens at every election. First of all sorry for the long post, Felt it needed posting so we all know which shops to boycott 🙂 This was on the Guardian website so reposting. 14 Steven Cohen CEO, Blue Inc.
Well they are only 0.02% of business leaders so why should they be considered as relevant 99.98% haven’t backed the tories. Publicly. They haven’t backed the Tories publicly. That’s probably because they’re not friends of Samantha Cameron.